We're offering $20 off tickets to The Events. Enter promo code TIMEOUT on the Malthouse Theatre website and receive a $20 discount from the standard ticket price (usually $65). 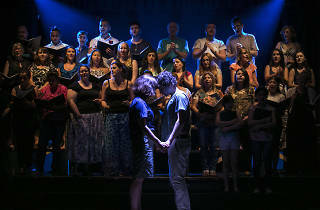 Just weeks after the tragic mass shooting at a gay nightclub in Orlando, The Events comes to Melbourne on its national tour. 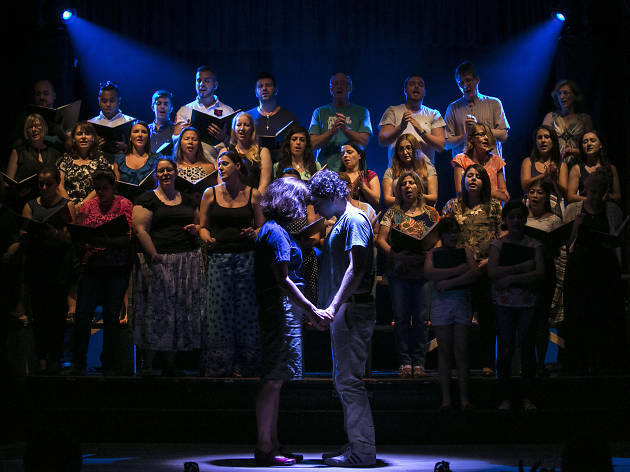 This play of anger, grief and church hymns was originally written by Scottish playwright David Greig in response to the 2011 mass shooting in Norway. Eleven choirs are on the roster in this Melbourne iteration to bring a fresh voice every night, as we try our best to process these unspeakable events. Priest and choir leader Claire (Catherine McClements) is left behind after her culturally and socially diverse choir is decimated in a horrific mass shooting event. With life shattered around her, she struggles to adapt to a life dogged by painful memories and the impossible, unanswerable question: why did this happen? For Claire to heal, it seems that the only path is to attempt to piece together the puzzle that is the the source of her grief: The Boy (Johnny Carr). Catherine McClements plays to the confusion and gritted teeth of her role with a tremendous amount of feeling. Johnny Carr, who goes between many roles throughout the show, brings a hollow, dangerous kind of passion to The Boy that is threatening and uncomfortably relatable. Carr’s performances as other characters (The Boy, after all, has infiltrated every aspect of Claire’s life) felt at times like superimposed mannerisms rather than full-body-and-soul transformations. Direction by Clare Watson, The Events is subtle and powerful, balancing the inherent malice of the subject matter with moving sweeps of bitter understanding and bottomless catharsis. Placing emphasis on Claire’s spiralling, warping grief process rather than the scene of the event itself, the show weaves in quiet dark humour to spin a bit of ever-so-slight brevity into the bleak backdrop of the play. The choirs are led by musical director Luke Byrne, who has conjured a haunting sense of mourning and community through the choir vocals. This is made even more resounding by John Browne’s original composition, especially in the ghostly chords of the final ballad, ‘We’re All Here’. Set and lighting design by Geoff Cobham is simple and effective, giving space for the show to breathe into life through the two fundamentals of theatre: imagination and communion.